Books from our college library have shelfmarks beginning ‘St Chad’s’. You will need to note the location as well – the record should tell you which library room has the book you need. See Finding your way around for locations of books by shelfmark and library rooms. Reference books: these have a shelfmark beginning with “Ref”. They are for reference use only and must not be moved from the library rooms. Reserve Library: the Reserve Collection contains the recommended and reading list books and these have to be checked out online by college library staff. They will be listed as “Current Loans” on your library record. The Reserve Library has books recommended for modules and reading list books. The Reserve Library’s holdings are for all subjects (Shelfmarks 000-999). We have increased this collection considerably over the last three years, often through student recommendations for purchase. All these books have an orange sticker on the spine and have to be checked out online by College Library staff in the Reserve Library. They will then be listed on your own library record. Unfortunately, we can’t leave these books in the other library rooms with 24 hour access as we need to monitor this stock and ensure that books are returned and that everyone has the opportunity to use them. The Reserve Library is open at specific times and these are displayed on the library door. It is usually four mornings and early afternoons during the week with evening openings every week day and at weekends. From Brewis, Williams, Wetherall, Fenton, Trounson: please leave books for these rooms in the “Returned Books” shelves or boxes in the appropriate room. From the Reserve Library: Reserve Collection books should be returned to the Reserve Library or left at College Reception for the Librarian. Please try to keep a quiet environment in the library rooms and don’t disturb other users. Drinks should be in screw top containers and food should not be taken into the library rooms The libraries should also be kept as tidy as possible – any personal belongings left overnight may be removed by the library staff. Personal belongings, including laptops, are left in the libraries at the owner’s risk; the College takes no responsibility for theft of or damage to personal property. For security, please make sure that library doors are locked when you leave the room. Email: If you can’t make the opening hours, books can also be requested by email to the College Librarian and will be left in College Reception for you to collect. This is an easy way to get hold of the books if you are not in College for the opening hours. 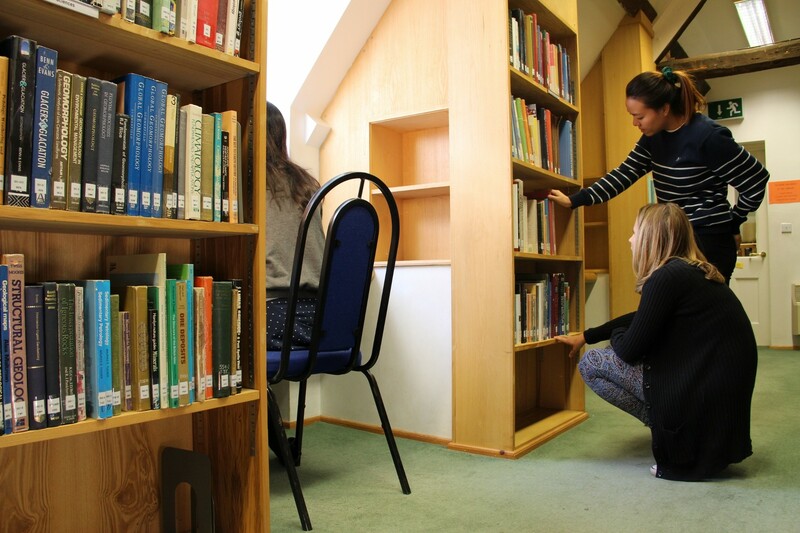 Number of books: undergraduates and postgraduates can borrow up to 20 college Reserve Collection books in addition to their quota of Main Library books. Loan period: three weeks for undergraduates and three months for postgraduates. Books can be renewed online in the same way as the Main Library books. Fines: do remember to renew your loans as there will be fines for overdue books. Recall / hold / reserve: if you need a book which is already checked out, please contact the Librarian and she will recall the book or arrange a book share if possible. All books are subject to recall if needed by another college student. Book returns: remember to return these books to the Reserve Library or to College Reception so that library staff can check them in online and remove them from your record. Access – Please Note: Although it may seem that these books are restricted compared to the 24 hour access to our other library rooms, there is still plenty of opportunity to browse or request them. Student Librarians have access to the rooms and would be happy to help you at any reasonable time and the College Librarian can also be flexible and rearrange hours if you need help.